Dear Reader Our annual report 2017 is for all the actors who are interested in youth information and counselling on all its levels. 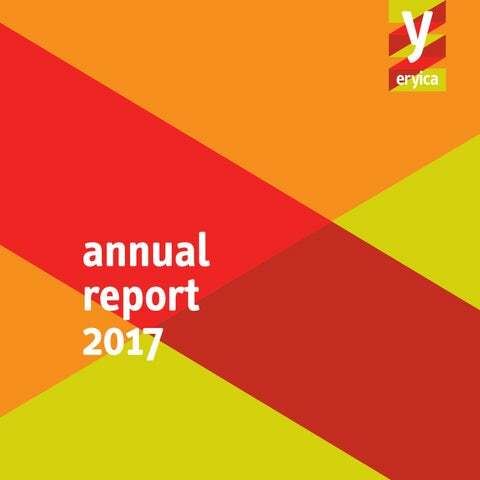 This report provides a good overview of ERYICA’s activities in the course of last year. It also makes visible the work done by the members, the Governing Board and the Secretariat throughout the year. Part of our work is reflected in the visible results we can now proudly present also to the policy makers and stakeholders as well as to a broad range of partners. Year by year our annual reports build a more comprehensive view of the importance of youth information and counselling services in relation to the growth and wellbeing of young people. ERYICA’s activities and services have kept their finger on the pulse yet again. We have been at the centre of relevant issues and phenomena concerning young people, youth work and youth policy. We can be proud of the many results of our work. One of the most significant is our publication Liaisons – Prevention of violent extremism through youth information. The work has been carried out during 2017 and in 2018 the publication is available in French and in English. My sincerest thanks go to all those who were involved in the making of it. Young people’s right to receive information was raised as a crucial right of citizenship in several discussions and forums on both national levels and within European youth policy. We have been actively involved in these discussions and declarations. This work has been carried out in a good cooperation with our members, the Governing Board and the Secretariat. of youth information and counselling services as well as our partners and stakeholders in giving information of our services and the support we can provide. It also offers us an important window on the world for which makes our work more visible and open to all. ERYICA has been a reliable and competent actor and partner at various levels. Good cooperation with European Youth Card Association (EYCA) and Eurodesk, among others, has been very important for us. For myself, as the President of ERYICA, it has been a pleasure to be able to participate and follow our activities. I would like to offer my thanks to our members and once more welcome the new members who joined us in 2017. My sincerest thanks also go to our partners and stakeholders for active cooperation. As the President of ERYICA and on behalf of the Governing Board, I would like to thank the Secretariat for your excellent and motivated work and support! We have successfully achieved the goals set for 2017. The year has been uplifting and our projects ambitious in many ways. Youth Information aims (among other objectives) to: •	Provide reliable, unbiased, accurate and youth-friendly information; •	Facilitate access to different sources and channels of information; •	Give an overview of options available on topics relevant to young people; •	Help young people to navigate the information overload of modern day society; •	Ensure that young people know their rights, services available and how to access them; •	Support young people in evaluating the available information and its quality; •	Guide young people to find the best options available to them and make their own decisions; •	Offer different channels of communication and dialogue to directly support young people in their search for information and knowledge; and •	Educate in media and information literacy. Finding your place in society. The aim of youth information and counselling is not only to meet the needs of the general public – its principal objective – but also to anticipate their needs and prepare preventative measures accordingly. Some of these needs will relate to key issues in society, notably, physical and mental health, highrisk behaviour, interpersonal relationships, discrimination, citizenship, active participation in society and access to social rights. Only by being adequately informed about one’s rights and duties is it possible to find a place in society and be a well-informed citizen. Creating an information culture. Today, young people are inundated with information and exposed to a wide variety of different media. This access to information is unprecedented, and having access to such a variety of media sources brings with it a previously unseen tendency for people to want to create their own media content, often in a personal and uncontrolled manner. In order to be a conscious citizen, it is important that one looks at this content critically, evaluating the quality, reliability, strategy and interest of those producing the information. In this context, youth information and counselling services take on a new aim; to educate young people on media and information literacy. 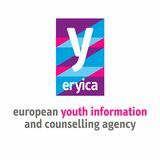 The European Youth Information and Counselling Agency (ERYICA) is an independent, international, nongovernmental and non-profit association composed of national and regional youth information coordination bodies and networks. It works to intensify European and international cooperation in the field of youth information work and services. ERYICA makes youth information work visible at local, national and international levels, and provides its members with opportunities for professional development, exchange and innovation. In 2017, our network consisted of 25 Members, 6 Affiliated organisations and 4 Co-operating organisations in 27 countries. ERYICA was established on 17 April 1986 in Madrid, Spain, and is currently registered in the Grand-Duchy of Luxemburg, in accordance with the 1928 Luxemburg. ERYICA believes in a society where all young people have access to youth friendly, reliable and comprehensive information, which promotes their autonomy, well-being and active citizenship in a global and digitalised world. To inspire, support and develop youth information and counselling in Europe and beyond. Quality youth information and counselling support services can only be achieved and ensured via trained professionals. The increasing emphasis on quality and quality assurance processes in formal and non-formal education at different policymaking levels inspires ERYICAâ&#x20AC;&#x2122;s commitment to strengthening and promoting the provision of quality youth information and counselling in Europe and beyond. •	Helsinki, Finland, 12-16 June 2017 As well as these courses, the YIntro is still an integral part of youth worker training in Wales and similar arrangements are also being made for the Digital YIntro course. These training courses were organised mainly by ERYICA Member Organisations that are free to initiate trainings, access the materials and cooperate with the trainers’ pool. Certain courses were also organised by the ERYICA Secretariat. Further fields of activities under this Strategic Direction included: •	Development of innovative training methods and topics, and staff mobility activities; •	Development and update of training materials and courses; •	Support to the network of ERYICA trainers through the use of specific communication tools and the dissemination of information ; •	Promotion of the existing training materials throughout the network and in countries willing to establish youth information and counselling services; •	Development of contacts with the formal education sector and other youth-related sectors in view of setting up common activities and projects; and •	Participation in the training activities of our stakeholders and partners. and evaluation methods for online courses in the youth work sector, and use the ERYICA Quality Management Catalogue to further increase the quality of youth information and counselling services. 2017 has been a busy year for the project, including the adaptation, piloting and revision of the YoMIM and the Digital YIntro training courses, as well as the development of an eLeaning Kit and a Quality tool. After two training of trainers courses and the implementation of the feedback, the project will continue with the translations of these two courses into 5 more languages (French, German, Spanish, Portuguese and Croatian), as well as the adaptation of the Jimmy and ALTYO training courses in 2018. ERYICA, Eurodesk, De Ambrassade (BE), Youth Work Ireland (IE), ACJ (ES), Mladiinfo International (MK), Young Scot (UK), IAJ (ES), CJP (BE), MOBIN Ljubljana (SL), PromoCymru (UK), Solna Youth Centre (SE), and DGJD (ES). Despite the importance of youth information in supporting young people to achieve their full potential, it is still difficult for many youth information and youth work providers to effectively promote and reach the vast majority of young people that do not take advantage of these services. This project aimed at broadening the understanding of practices and policies in youth work and youth information internationally, and at enhancing the modernisation and effectiveness of the promotion of youth work and youth information services. The project activities included: 1.
the needs identified (5-7 April 2017). The training aimed to address the needs of youth work and youth information structures in optimising the promotion of their services among young people, and in establishing efficient marketing and communication mechanisms to make their services attractive to them. An e-publication comprised of the most significant challenges of the sector in terms of reaching out to more young people, which were identified through the survey, outcomes of the training event, and good practices to tackle these challenges from the 3 networks. Brussels in September 2017, at the Working Group meeting of the French-speaking members of ERYICA in October 2017, and also ran a training session at the conference Youth Work Against Violent Extremism, which took place in Malta in November 2017. Further details can be found under Strategic Direction 4 – Council of Europe. OSRS (BiH), Koordinaatti (FI), MladiInfo (FYROM), Aġenzija Żgħażagħ (MT), ACJ (ES), IAJ (ES), Youth Work Ireland (IE), CIJ (LU), Jauniems (LT), Forum for Ungdomsinformasjons-kontor (NO), MISSS (SI), EDIT Centar (SRB). The Advanced YIntro course targets experienced youth information workers who aim to further develop their skills and competences, as well as to broaden their expertise on a more abstract level of youth information. The project included two activities, an international Advanced YIntro training of trainers, and then a training course. The first course, hosted by OSRS in Sarajevo, Bosnia and Herzegovina, offered a solution for increasing the number of Advanced YIntro trainers and therefore the dissemination of the course as well. A participant of this course had the opportunity to put his new trainer skills into practice during the training course in Luxembourg, hosted by CIJ and ERYICA. The effects of social and economic change on young people have a clear impact on the work of youth information and counselling professionals. In addition, the introduction of innovative digital tools popular among young people is changing the nature and channels used to provide youth information and counselling services. Thus, youth information workers need to be aware of and familiar with new trends and technologies that influence and shape the sector. Collaboration with the Pool of European Youth Researchers (EU-CoE Youth Partnership) ERYICA is a member of the European Platform on Learning Mobility (EPLM), which aims to create a participatory space for exchange and cooperation between practitioners, researchers and policy makers. Read more under Strategic Direction 4. The organisation has also collaborated with Manfred Zentner, member of the Pool of European Youth Researchers, in the drafting of the theoretical part of the Liaisons manual. Further activities under this Strategic Direction included: •	Organisation of an Open Dialogue Day on Mobility with researchers and stakeholders in the field in connection with the MOVE project; •	Identification of researchers on youth policy through dialogue with research institutes and higher education institutions; •	Dissemination of research results and publications among the members throughout the network’s channels; and •	Participation in research projects and project proposals dealing with youth policy and addressing the Strategic Directions and Thematic Priorities of ERYICA, especially under Horizon 2020. ERYICA, Universitat Hildesheim (DE), Deutsches Jugendinstitut, Academia (DE), De Studii Economice Din Bucuresti (RO), University of Miskolc (HU), Hogskulen i Sogn og Fjordane (NO), Ilustre Colegio Nacional de Doctores y Licenciados en Ciencias Politicas y Sociologia (ES), European Research and Project Office (DE). The aim of the MOVE project is to provide a research-informed contribution towards an improvement of the conditions of the mobility of young people in Europe and a reduction of the negative impacts of mobility through the identification of good practice, thus fostering sustainable development and well-being. The main research question was: How can the mobility of young people be ‘good’ both for socio-economic development and for individual development of young people, and what are the factors that foster/hinder such beneficial mobility? Six types of mobility were addressed in this research: higher education, voluntary work, employment, vocational training, pupil’s exchange and entrepreneurship. In February 2017, ERYICA organised an Open Dialogue day on youth mobility and youth transitions, inviting stakeholders working at European level to discuss the results of the MOVE project so far. A second workshop was organised in Stockholm in November 2017, to disseminate the research results in areas of Europe where the research was not carried out. Participants from Sweden, Finland, Norway, Lithuania, Latvia and Estonia attended this event. The event was combined with the first meeting of the ERYICA Nordic-Baltic Working Group. The project aimed at enhancing the quality of youth information by developing a guide for youth information workers based on the exchange of practices, which would then be applied by youth information centres in Europe. Under this project, a survey was carried out, its results were elaborated and the identified needs were incorporated in a methodological guide for youth information work, including good practice examples. The project also included a training event for youth information centre staff, and ERYICA contributed at this event. ERYICA, EPTO - European Peer Training Organisation (BE), Bundesnetzwerk Osterreichische Jugendinfos Verein (AT), Jugend- und Familienstiftung des Landes (JUP) Berlin (DE), Latvian Youth Council (LT), Youth Work Ireland (IE), and Abo Akademi (FI). The overarching aim of this project is to increase the quality and outreach of youth information at local level by creating and applying user-friendly methods built on evidence-based youth information needs and involving peer-to-peer youth information educators. The first part of the project involved carrying out a survey in 20 countries, and in 18 different languages, aiming to identify the information needs of young people. This survey was addressed to both users and non-users of youth information services, and it gathered a total of 3,476 responses between December 2017 and February 2018. Researchers from the Information Studies Department of Åbo Akademi in Finland, in collaboration with ERYICA, analysed how young people’s needs and attitudes have evolved in the past few years. Engaging youth in decision-making is essential to their overall development and ensures stable valuebased and democratic societies. The concepts of ‘participation’ and ‘empowerment’ in the youth information and counselling context imply giving young people more control over their personal development and decisions. The raising use of innovative digital tools among young people opens up interesting opportunities for increasing their participation in decision-making processes. Activities Contribution to the activities related to the EUth consortium See EUth in Projects. Development of a training kit / course on eParticipation in connection with the EUth project See EUth in Projects. in 2018, including projects and activities from the years 2017-2018. Participation in the No Hate Speech Movement meetings and support of the campaign launched by the Council of Europe ERYICA is a partner and a proud supporter of the No Hate Speech Movement. The Agency was represented in the followup group of the Movement in the course of 2017. News and developments were regularly published on our website, social media groups and newsletters, while direct communication to Members encouraged their participation in different actions. (Read more under Strategic Direction 4 – Council of Europe). Promotion of the Kit on Access to Rights Both in the framework of the cooperation between the Council of Europe and ERYICA and at other events, numerous occasions provided space for the promotion of the kit on young people’s access to rights. Read more under Strategic Direction 4 – Council of Europe. Involvement of youth ambassadors in the activities of the Agency ERYICA’s Youth Ambassadors have been offered further opportunities to engage in the activities of the organisation. These include participation in professional development processes in order to ensure that the outcomes of our work meet the needs of young people (e.g. within projects, such as the MOVE Open Dialogue Day in Brussels on 9 February 2017), as well as opportunities for participation in events as Youth Ambassadors of ERYICA, and the EU Youth Conference organised by the Maltese Presidency of the Council of the European Union in Qawra on 20-23 March 2017. In 2017, Youth Ambassadors participated in the Youth for Tomorrow’s Europe conference in Malta on 14-17 May and were invited to the Working Group on the revision of the European Youth Information Charter and the MOVE preconference. These latter events took place in 2018, but arrangements were made in the course of 2017. During the year, ERYICA started developing a framework to involve Youth Ambassadors in the activities of our network in a more structured way. 11 partners from 8 European countries including IJAB. The evolution of European policy-making strategies towards a more international scope, calls for exploring new collaboration arenas at the international level. ERYICA aims to reinforce and deepen its relationships and co-operation with a selected group of international institutions and partner organisations, while of course staying open to collaboration with other stakeholders. These relationships shall be based on the endorsement of common policy goals and priority areas. Jeunesse (Belgium) is a 240-page toolkit on the prevention of violent extremism through youth information and counselling. The first part of the manual is theoretical and allows the reader to understand the mechanisms and the reasons behind violent extremism. It aims to define the role of youth (information) workers in the prevention of violent extremism. The second part is a practical toolbox, and includes a range of over 50 activities, divided into the following chapters: •	Self-confidence, self-esteem, knowing yourself (identity, talents, projects and dreams) •	Diversity and living together (Understanding others, stereotypes, prejudices, discrimination, interculturality) •	Communication (expressing ideas, debating, conflict management) •	Media and information literacy (critical thinking, media, propaganda, conspiracy theories) The activities in the toolbox have been selected due to their relevance and capacity to have a positive impact on young people. The reader will find learning objectives, practical information (target group, material, group size), a detailed description of how to carry out the activity, as well as advice, in each activity. The electronic publication was published on 15 December 2017, while the printed version was ready at the end of December 2017. The English version will be finalised in the first quarter of 2018. CDEJ Meetings: 27-29 March, Budapest, Hungary & 16-18 October 2017, Strasbourg, France ERYICA is observer of the CDEJ (European Steering Committee for Youth), a statutory body of the Council of Europe that is comanaging the youth activities and budget of the Department of Youth and Sport together, on an equal basis, with the Advisory Council on Youth. Meetings of the CDEJ have been seized as an opportunity to discuss youth information development with the responsible persons of the Ministries in charge of youth. The two meetings of 2017 took place in Budapest on 27-29 March 2017 and in Strasbourg on 16-18 October 2017. The Director represented ERYICA at both meetings. activities throughout the year. As the European campaign was coming to an end in 2017, ERYICA also disseminated its evaluation survey in the ERYICA network and provided input for the evaluation process. Meeting of the JCC: Strasbourg, France, 18 October 2017 Since 1997, ERYICA activities with the Council of Europe have been developing within the framework of the Partnership Agreement that is maintained through the work of the Joint Coordinating Committee (JCC). One JCC meeting took place in 2017, after the CDEJ meeting in Strasbourg. The meeting defined the activities of the cooperation for 2018, which are centred around the organisation of a seminar on youth information and counselling in Ukraine and support of the development of youth information services in the country in collaboration with the National Association of Youth Centres and the Ministry of Youth and Sports. The dissemination of Liaisons and other publications realised in the framework of the Partnership Agreement between the Council of Europe and ERYICA also remains a priority in 2018. The two institutions celebrated 20 years of cooperation in 2017, which was recognised and appreciated by Director of Democratic Citizenship and Participation at the Council of Europe and the President of ERYICA. No Hate Speech Movement (NHSM) ERYICA is a recognised partner organisation of the No Hate Speech Movement. The Agency has an observer seat in the followup group of the Campaign. The group functioned as the Steering Group of the Movement, while the meetings also provide an opportunity to showcase the engagement of ERYICA in the NHSM, report on our related activities and engage in further cooperation. One follow-up group meeting took place in Strasbourg on 18-19 September 2017. Dissemination Activities of CoE initiatives and Publications The promotion of the Youth Information Starters Kit, the Compendium of National Youth Information and Counselling Structures, as well as the Kit on Young Peopleâ&#x20AC;&#x2122;s Access to Rights, realised in cooperation with the Council of Europe and ERYICA, has continued. The activity has expanded with the promotion and dissemination of the Liaisons toolkit. ERYICA also provided dissemination for CoE publications, recommendations and policy documents. In 2017, this included the Action Plan on Protecting Refugee and Migrant Children, the MOOC entitled Essentials of Youth Policy and numerous initiatives of the No Hate Speech Movement, among others. Meeting Quality Labels: International information resources for the development of youth centres – Chernigov, Ukraine, 30-31 May 2017 The CoE requested ERYICA to propose an expert in international information resources for the development of youth centres in Ukraine and the Caucasus area. Kerstin Giebel (IJAB) represented ERYICA as a network expert at this event that gathered several interested organisations active in the youth sector. The meeting also played a role in defining the directions of the cooperation between ERYICA and the CoE for 2018.
quite involved, but at the CoE level as a whole. It also provides opportunity to meet INGOs in other sectors that work with the CoE, therefore increasing our capacity for cross-sectorial cooperation. Stakeholders 3 networks collaboration In the spirit of the Memorandum of Understanding signed in 2016, the three networks continued the promotion of their common position paper entitled Engage, Inform, Empower – Recommendations from the main European youth information and mobility networks on the new EU Youth Strategy. The document puts forward the recommendations of the three networks in their field of expertise. The three networks also completed a joint project, entitled Reach More Young People, with support from the Erasmus+ Programme. Read more under Strategic Direction 1, Projects. The Governing Boards of the three networks had a joint meeting in Brussels on 28 June 2017, where the discussions included potential future cooperation areas. The event aimed to strengthen the active cooperation of the three networks further. Eurodesk •	Eurodesk Summit 2017 – Essen, Germany, 15-19 March 2017; •	European Youth Week seminar – Brussels, 2 May 2017; •	Eurodesk Multipliers meeting – Brussels, 15 June 2017; and •	Time to Move Campaign 2017 closing event – Brussels, 17 November 2017. European Youth Card Association (EYCA) •	EYCA New Year’s reception – Brussels, 16 January 2017; •	EYCA Seminar on prevention of youth violent extremism through the youth card – Nicosia, Cyprus, 30-31 January 2017; •	EYCA General Assembly and 30th Anniversary – Belgrade, Serbia, 1-3 June 2017; and •	EYCA high-level event: Empowering Europe’s Youth to Shape the EU Youth Strategy – Brussels, 6 November 2017. Establishment of contacts with other stakeholders at European and international level, such as: •	European Peer Training Organisation (EPTO); •	International Observatory for Juvenile Justice (OIJJ); and •	Universities and networks of universities. •	Editing and approval of the Work Programme 2017; •	Modification of the Standing Orders; •	Inspiring speech; •	Presentation of the outcomes of the Working Group on the communication strategy; •	Presentation of stakeholders; •	Presentation of ERYICA projects; •	Presentation of the activity report of the network 2017; •	Results of the Members’ Survey 2016; and •	Elevator pitch on Members’ projects and good practices from the network. The General Assembly elected CIDJ, represented by Claire Conlon, to the vacant seat of the Governing Board. ERYICA Working Groups Several Working Groups have undertaken specific tasks to move the development of the network and the organisation forward. The creation of Working Groups is a great way of combining Members’ expertise and ERYICA’s European outreach for the development of youth information and counselling. In 2017, the following Working Groups were active: •	Working Group on the ERYICA Strategy; •	Working Group of French-speaking Members; •	Iberian meeting and creation of an Iberian Working Group; •	Working Group of Nordic-Baltic Members; •	Working Group on the European Youth Information Charter. Interns under the Erasmus Placement Programme continue forming an integral part of the ERYICA Team. Besides reinforcing ERYICA’s European identity and ensuring the involvement of young people in our everyday activities, the placement provides an opportunity for the trainees to get to know more about youth information and counselling services and at the same time gather work experience. Kyriaki Fotiadou from Greece and Inkeri Poskiparta from Finland supported the activities of the Secretariat in 2017. Communication & Public Relations Website As part of the implementation of the communication strategy, ERYICA has published a new website. The new design and navigation is in line with new, userfriendly trends and the content is published in a structure that provides an easier overview for the visitor. The new website is an important step in the rationalisation of ERYICA’s online presence, diminishing the number of relays and grouping services. In this process, the old interfaces of the Information Right Now! campaign and the YoMIM site and app have been closed down in early 2018. ERYICA’s social media interfaces continued attracting followers over the year 2017. The Facebook page accumulated 3,056 fans, a 10% increase within one year. Our posts were read 104,755 times, which is a 10% decrease on the year before. This is most probably to do with the unlinking of the Facebook and Twitter accounts in line with the new communication strategy, recognising that the two platforms need different content to best meet followers’ expectations. Since November 2015, ERYICA has had a liaison desk at the premises of our Belgian Member Organisation, De Ambrassade, in order to ensure more frequent representation in the European capital and to be closer to our stakeholders. The arrangement means access to meeting rooms, that all Member Organisations of ERYICA can benefit from, following prior consultation with the Secretariat. Among other meetings and events, in 2017 the Brussels representation hosted for example an Open Dialogue Day on the prevention of youth violent extremism in the framework of the cooperation between the Council of Europe and ERYICA, meetings of the French-speaking Working Group, a Governing Board meeting, and a 3 networks meetings of EYCA, Eurodesk and ERYICA. ERYICA’s Twitter account had 1,077 followers on 31 December 2017, which corresponds to an intensive growth of 24% in a year. The outreach of our tweets amounts to 217,400 for the year 2017, making Twitter ERYICA’s most effective social media tool. This growing engagement of followers also translated into a high number of likes (881) and retweets (471). ERYICA started using Instagram more actively during the last year and counts 117 followers at the moment. The use of LinkedIN will be further explored and exploited in the course of 2018. European Youth Information Day The 17th April traditionally gives space to the activities of the European Youth Information Day, promoting youth information and counselling across Europe. In 2017, ERYICA chose the subject of fake news and the reliability of information, and addressed it through a meme competition. Members, stakeholders and young people were invited to create and publish memes beginning with the phrase “Who told you…” and mark it with #checkyoursource. The winners of the competition were voted by the 28th General Assembly. As well as this initiative, youth information centres traditionally organise activities with young people on this day and benefit from the promotion and visibility opportunity it represents. As of 31 December 2017, ERYICAâ&#x20AC;&#x2122;s membership counted 25 Members, 6 Affiliated organisations and 4 Cooperating organisations in 27 countries.